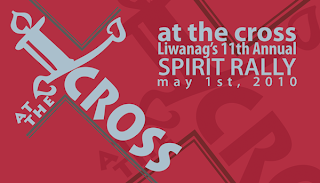 If you haven't heard, Liwanag (aka Light of God) at UCI is putting together a Spirit Rally this Saturday, May 1st at Crystal Cove in the UCI Student Center. 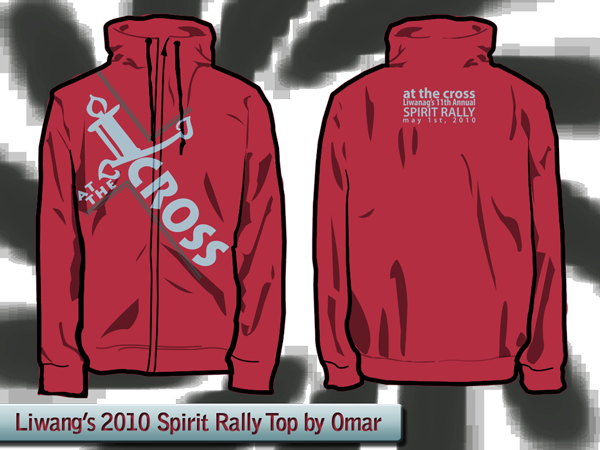 This here is just a sneak peek to what the shirts for this Rally / Fundraiser are going to look like. Liwanag is the Filipino Catholic Community at UC Irvine. They are a well-rounded group of young adults that volunteer their time and talents to raise funds for the Homeless, pardon me... the HOUSELESS. And recently have joined efforts to aid the not so fortunate communities of the Philippines along side Kanang Kamay. The funds from this Rally will make possible the collection of the essential school supplies for children. So please join Liwanag and the UC Community in an evening of Praise & Worship filled with loads of fun activities and surprises. MARK YOUR CALENDARS for May 1st, 2010!!! Doors open at 3p.m. and the night will start shortly thereafter. The event will take place in the Crystal Cove Auditorium at the UCI Student Center. BE THERE! BRING YOUR FAMILY AND FRIENDS! PRAISE & WORSHIP --- THRICE!!! Yet another small peek to one of the special surprises that this night of Praise, Worship & Outreach has in store for ALL. Remember that this is an open event to Anyone and EVERYONE regardless. An evening dedicated to family and community. JOIN THE CELEBRATION! ... THRICE!